The following pages offer you some widely-used PhpSpreadsheet recipes. Please note that these do NOT offer complete documentation on specific PhpSpreadsheet API functions, but just a bump to get you started. If you need specific API functions, please refer to the API documentation. 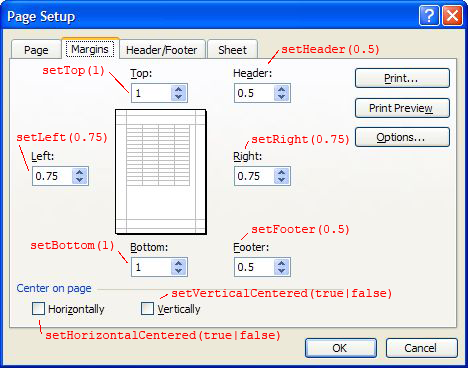 For example, setting a worksheet's page orientation and size covers setting a page orientation to A4. Other paper formats, like US Letter, are not covered in this document, but in the PhpSpreadsheet API documentation. PhpSpreadsheet allows an easy way to set a spreadsheet's metadata, using document property accessors. Spreadsheet metadata can be useful for finding a specific document in a file repository or a document management system. For example Microsoft Sharepoint uses document metadata to search for a specific document in its document lists. "Test document for Office 2007 XLSX, generated using PHP classes." will change the currently active sheet to the worksheet called "DataSheet". In Excel, dates and Times are stored as numeric values counting the number of days elapsed since 1900-01-01. For example, the date '2008-12-31' is represented as 39813. You can verify this in Microsoft Office Excel by entering that date in a cell and afterwards changing the number format to 'General' so the true numeric value is revealed. Likewise, '3:15 AM' is represented as 0.135417. PhpSpreadsheet works with UST (Universal Standard Time) date and Time values, but does no internal conversions; so it is up to the developer to ensure that values passed to the date/time conversion functions are UST. The above methods for entering a date all yield the same result. \PhpOffice\PhpSpreadsheet\Style\NumberFormat provides a lot of pre-defined date formats. The \PhpOffice\PhpSpreadsheet\Shared\Date::PHPToExcel() method will also work with a PHP DateTime object. Similarly, times (or date and time values) can be entered in the same fashion: just remember to use an appropriate format code. See section "Using value binders to facilitate data entry" to learn more about the AdvancedValueBinder used in the first example. Excel can also operate in a 1904-based calendar (default for workbooks saved on Mac). Normally, you do not have to worry about this when using PhpSpreadsheet. This is regardless of which language version of Microsoft Office Excel may have been used to create the Excel file. When the final workbook is opened by the user, Microsoft Office Excel will take care of displaying the formula according the applications language. Translation is taken care of by the application! The following line of code writes the formula =IF(C4>500,"profit","loss") into the cell B8. Note that the formula must start with = to make PhpSpreadsheet recognise this as a formula. If you want to write a string beginning with an = character to a cell, then you should use the setCellValueExplicit() method. If you need the calculated value of a cell, use the following code. This is further explained in the calculation engine. If Russian language files aren't available, the setLocale() method will return an error, and English settings will be used throughout. Once you have set a locale, you can translate a formula from its internal English coding. Currently, formula translation only translates the function names, the constants TRUE and FALSE, and the function argument separators. In Microsoft Office Excel you get a line break in a cell by hitting ALT+"Enter". When you do that, it automatically turns on "wrap text" for the cell. Read more about formatting cells using getStyle() elsewhere. Read more about AdvancedValueBinder.php elsewhere. Note that there are additional page settings available. Please refer to the API documentation for all possible options. 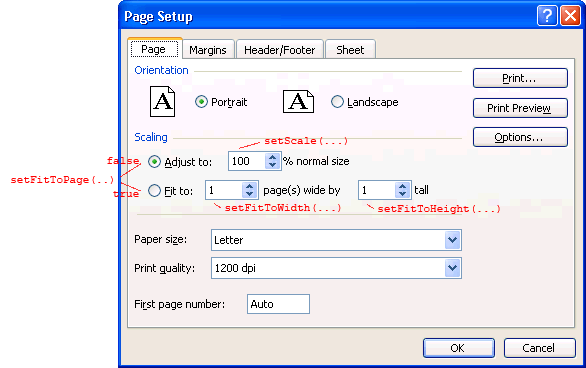 The page setup scaling options in PhpSpreadsheet relate directly to the scaling options in the "Page Setup" dialog as shown in the illustration. As you can see, it is not necessary to call setFitToPage(TRUE) since setFitToWidth(...) and setFitToHeight(...) triggers this. If you use setFitToWidth() you should in general also specify setFitToHeight() explicitly like in the example. Be careful relying on the initial values. Note that the margin values are specified in inches. Substitution and formatting codes (starting with &) can be used inside headers and footers. There is no required order in which these codes must appear. Superscript and subscript cannot both be ON at same time. Whichever comes first wins and the other is ignored, while the first is ON. &L Code for "left section" (there are three header / footer locations, "left", "center", and "right"). When two or more occurrences of this section marker exist, the contents from all markers are concatenated, in the order of appearance, and placed into the left section. &P Code for "current page #"
&N Code for "total pages"
&font size Code for "text font size", where font size is a font size in points. &K Code for "text font color" - RGB Color is specified as RRGGBB Theme Color is specifed as TTSNN where TT is the theme color Id, S is either "+" or "-" of the tint/shade value, NN is the tint/shade value. &C Code for "center section". When two or more occurrences of this section marker exist, the contents from all markers are concatenated, in the order of appearance, and placed into the center section. &U Code for "text single underline"
&E Code for "double underline"
&R Code for "right section". When two or more occurrences of this section marker exist, the contents from all markers are concatenated, in the order of appearance, and placed into the right section. &Z Code for "this workbook's file path"
&F Code for "this workbook's file name"
&A Code for "sheet tab name"
&"font name,font type" Code for "text font name" and "text font type", where font name and font type are strings specifying the name and type of the font, separated by a comma. When a hyphen appears in font name, it means "none specified". Both of font name and font type can be localized values. &"-,Bold" Code for "bold font style"
&B Code for "bold font style"
&"-,Regular" Code for "regular font style"
&"-,Italic" Code for "italic font style"
&I Code for "italic font style"
&"-,Bold Italic" Code for "bold italic font style"
&O Code for "outline style"
&H Code for "shadow style"
That reveals the codes for the even/odd header and footer. Experienced users may find it easier to rename test.xlsx to test.zip, unzip it, and inspect directly the contents of the relevant xl/worksheets/sheetX.xml to find the codes for header/footer. To set a print break, use the following code, which sets a row break on row 10. Tip It is recommended to style many cells at once, using e.g. getStyle('A1:M500'), rather than styling the cells individually in a loop. This is much faster compared to looping through cells and styling them individually. This alternative method using arrays should be faster in terms of execution whenever you are setting more than one style property. But the difference may barely be measurable unless you have many different styles in your workbook. You often want to format numbers in Excel. For example you may want a thousands separator plus a fixed number of decimals after the decimal separator. Or perhaps you want some numbers to be zero-padded. In Microsoft Office Excel you may be familiar with selecting a number format from the "Format Cells" dialog. Here there are some predefined number formats available including some for dates. The dialog is designed in a way so you don't have to interact with the underlying raw number format code unless you need a custom number format. Tip The rules for composing a number format code in Excel can be rather complicated. Sometimes you know how to create some number format in Microsoft Office Excel, but don't know what the underlying number format code looks like. How do you find it? Advanced users may find it faster to inspect the number format code directly by renaming template.xlsx to template.zip, unzipping, and looking for the relevant piece of XML code holding the number format code in xl/styles.xml. In PhpSpreadsheet it is easy to apply various borders on a rectangular selection. Here is how to apply a thick red border outline around cells B2:G8. In Microsoft Office Excel, the above operation would correspond to selecting the cells B2:G8, launching the style dialog, choosing a thick red border, and clicking on the "Outline" border component. Note that the border outline is applied to the rectangular selection B2:G8 as a whole, not on each cell individually. If you simultaneously set e.g. 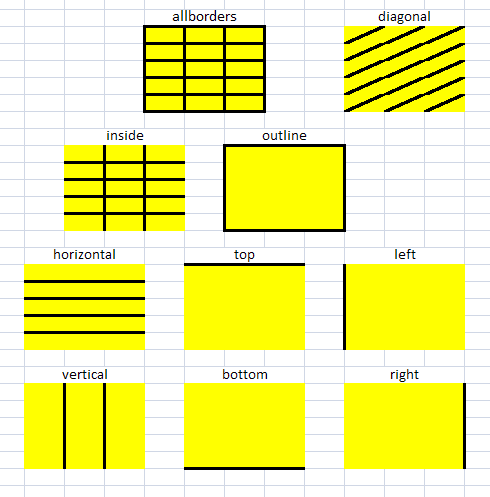 allBorders and vertical, then we have "overlapping" borders, and one of the components has to win over the other where there is border overlap. In PhpSpreadsheet, from weakest to strongest borders, the list is as follows: allBorders, outline/inside, vertical/horizontal, left/right/top/bottom/diagonal. This border hierarchy can be utilized to achieve various effects in an easy manner. The following table lists the valid array keys for \PhpOffice\PhpSpreadsheet\Style\Style::applyFromArray() classes. If the "Maps to property" column maps a key to a setter, the value provided for that key will be applied directly. If the "Maps to property" column maps a key to a getter, the value provided for that key will be applied as another style array. A cell can be formatted conditionally, based on a specific rule. For example, one can set the foreground colour of a cell to red if its value is below zero, and to green if its value is zero or more. Document: allows you to set a password on a complete spreadsheet, allowing changes to be made only when that password is entered. Cell: offers the option to lock/unlock a cell as well as show/hide the internal formula. When using a data validation list like above, make sure you put the list between " and " and that you split the items with a comma (,). It is important to remember that any string participating in an Excel formula is allowed to be maximum 255 characters (not bytes). This sets a limit on how many items you can have in the string "Item A,Item B,Item C". Therefore it is normally a better idea to type the item values directly in some cell range, say A1:A3, and instead use, say, $validation->setFormula1('Sheet!$A$1:$A$3'). Another benefit is that the item values themselves can contain the comma , character itself. If you want PhpSpreadsheet to perform an automatic width calculation, use the following code. PhpSpreadsheet will approximate the column with to the width of the widest column value. The measure for column width in PhpSpreadsheet does not correspond exactly to the measure you may be used to in Microsoft Office Excel. Column widths are difficult to deal with in Excel, and there are several measures for the column width. PhpSpreadsheet always operates with "3. Full width in character units" which is in fact the only value that is stored in any Excel file, hence the most reliable measure. Unfortunately, Microsoft Office Excel does not present you with this measure. Instead measures 1 and 2 are computed by the application when the file is opened and these values are presented in various dialogues and tool tips. The character width unit is the width of a 0 (zero) glyph in the workbooks default font. Therefore column widths measured in character units in two different workbooks can only be compared if they have the same default workbook font.If you have some Excel file and need to know the column widths in measure 3, you can read the Excel file with PhpSpreadsheet and echo the retrieved values. To set a worksheet's column visibility, you can use the following code. The first line explicitly shows the column C, the second line hides column D.
You can also collapse the column. Note that you should also set the column invisible, otherwise the collapse will not be visible in Excel 2007. Please refer to the section "group/outline a row" for a complete example on collapsing. Excel measures row height in points, where 1 pt is 1/72 of an inch (or about 0.35mm). The default value is 12.75 pts; and the permitted range of values is between 0 and 409 pts, where 0 pts is a hidden row. To set a worksheet''s row visibility, you can use the following code. The following example hides row number 10. Note that if you apply active filters using an AutoFilter, then this will override any rows that you hide or unhide manually within that AutoFilter range if you save the file. You can also collapse the row. Note that you should also set the row invisible, otherwise the collapse will not be visible in Excel 2007. You can also add images created using GD functions without needing to save them to disk first as In-Memory drawings. A commonly asked question is how to retrieve the images from a workbook that has been loaded, and save them as individual image files to disk. The following code extracts images from the current active worksheet, and writes each as a separate file. This invoice is payable within thirty days after the end of the month unless specified otherwise on the invoice. Optionally, a fourth parameter can be passed defining the named range local (i.e. only usable on the current worksheet). Named ranges are global by default. \PhpOffice\PhpSpreadsheet\Writer\Xlsx uses temporary storage when writing to php://output. By default, temporary files are stored in the script's working directory. When there is no access, it falls back to the operating system's temporary files location. This may not be safe for unauthorized viewing! Depending on the configuration of your operating system, temporary storage can be read by anyone using the same temporary storage folder. When confidentiality of your document is needed, it is recommended not to use php://output. Make sure not to include any echo statements or output any other contents than the Excel file. There should be no whitespace before the opening <?php tag and at most one line break after the closing ?> tag (which can also be omitted to avoid problems). Make sure that your script is saved without a BOM (Byte-order mark) because this counts as echoing output. The same things apply to all included files. Failing to follow the above guidelines may result in corrupt Excel files arriving at the client browser, and/or that headers cannot be set by PHP (resulting in warning messages). There might be a situation where you want to generate an in-memory image using GD and add it to a Spreadsheet without first having to save this file to a temporary location. Note that zoom level should be in range 10 - 400. Think of createSheet() as the "Insert sheet" button in Excel. When you hit that button a new sheet is appended to the existing collection of worksheets in the workbook. In Excel the sheet state "very hidden" can only be set programmatically, e.g. with Visual Basic Macro. It is not possible to make such a sheet visible via the user interface. Worksheets can be set individually whether column A should start at left or right side. Default is left. Here is how to set columns from right-to-left.